Paiste Signature Reflector Bell Ride 22"
Signature Reflector Bell Ride 22", Ride Cymbal from Paiste in the Signature series. 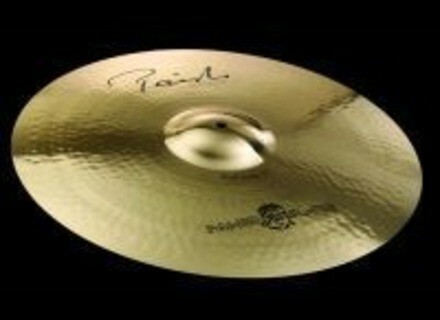 Paiste announces the introduction of the Signature Reflector Bell Ride. This Ride was created by Paiste's Sound Development team in collaboration with Nicko McBrain, the drummer of "Iron Maiden". The Reflector Bell Ride is reminiscent of the Sound Creation Bell Ride, which Nicko McBrain used throughout the 1980's. The original concept was updated according to his current specifications and executed in the Signature Series, utilizing Paiste's unique Reflector finish. According to Paiste, the Reflector Bell Ride in 20" and 22" features a full, fairly dark, controlled, glassy and shimmering sound character, a clear full ping over a large, deep harmonic wash, and a dominant, strong bell, making it extremely well suited for the intricate ride stick work that is one of the hallmarks of Nicko McBrain's playing style within the context of the music of Iron Maiden. As a tribute to Nicko's collaborative effort in the creation of this unique cymbal, the label "Powerslave" and a rendition of Iron Maiden's mascot, Eddie, have been placed on the 22" version of the cymbal. [Musikmesse] TreeWorks Chimes MultiTree TreeWorks Chimes has announced a New MultiTree™ Chime with an extended range of chimes for longer sweeps.